Newcastle Archives - Shelving & Racking Ltd.
Second hand racking orders are leaving us at a rate of knots, a great way to start the new financial year! In the next week or so we have part loads of used pallet racking heading for London, longspan shelving destined for Stockport, carpet racking going to Birmingham and some cantilever racking to be delivered to Newcastle, so if you are close by and ready to place an order, call us now for a great delivered price. We have good stocks of all leading manufacturers of warehouse racking, particularly Dexion, Link 51, Redirack and Apex. 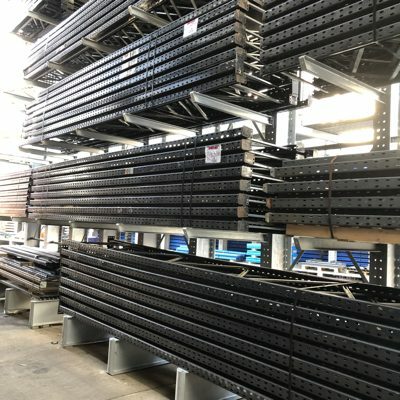 We always have huge quantities of new heavy duty shelving in stock, along with all racking accessories such as column guards, pallet support bars and wire mesh decking. Please call us on 0800 612 3210 to discuss your second hand racking options or send us an enquiry form and we will get back to you quickly. We are always looking buy used pallet racking in medium to large parcels and in very good condition. Leading manufacturers such as Dexion, Redirack, Apex and Link 51 are always of interest but we will consider all other makes (Hilo, Esmena, Stow, Mecalux etc.) if the quantity and quality is right. We will also consider heavy duty shelving, such as longspan, and large amounts of bolted shelving if it is in great condition. If you have warehouse racking that you no longer need or use, please give us a call with as many details as you have, such as the sizes and quantities of upright frames and horizontal beams, whereabouts in the UK it is and whether or not you would need us to take it down and transport it. So if you are in Bristol, Bournemouth, Newcastle or Northampton, call us on 0800 612 3210 or use the enquiry form to send us a message and we will get beck to you quickly. Used pallet racking- what type do you have? 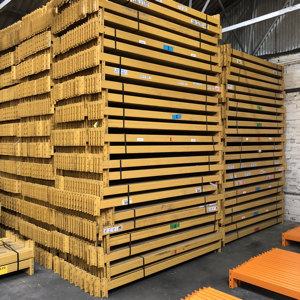 Buying used pallet racking can appear to be a complicated task if it’s something you haven’t looked into before, but we have years of experience and are always happy to help you to find the right racking system for your needs. There are many different manufacturers of warehouse racking and none of them are compatible with each other, so it important that you know what you have before you can think about adding to it. 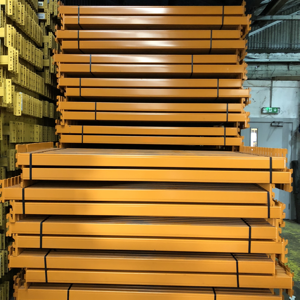 You can see images of the most popular pallet racking systems on our Identify My Racking page, or you can send us a photo of your racking and we will let you know what you have. Dexion, Link 51, Redirack and Apex are some of the leading industrial racking manufacturers but there are many others that we have in stock. 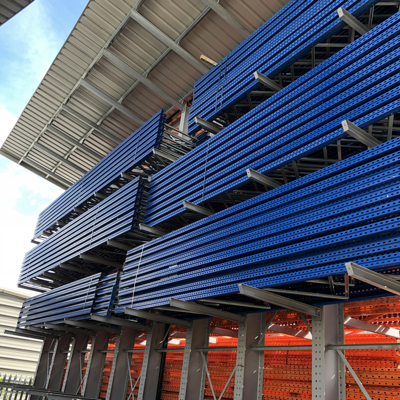 We can also help you with the layout, dimensions and load capacities of your racking, our friendly and helpful team can work from your plans or arrange a site visit if required. 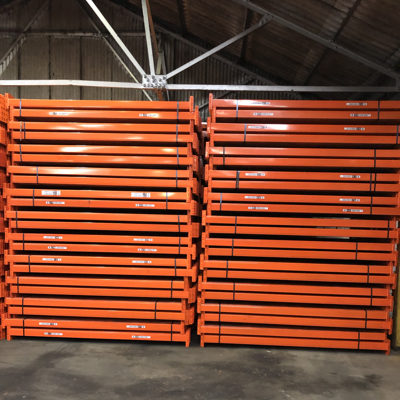 We have deliveries leaving our warehouse every day, so whether you are in Bristol, Kent, Liverpool or Newcastle we will get your used pallet racking order to you quickly and in great condition. Call us now on 0800 612 3210, or send us an enquiry form and we will reply to you quickly. 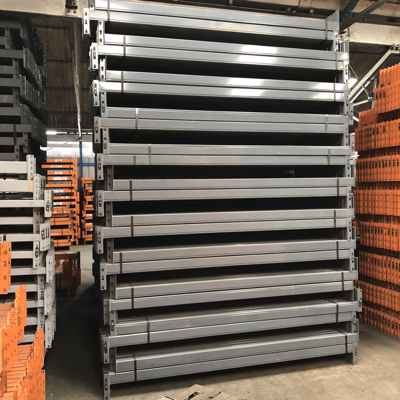 Our Link 51 used pallet racking stocks are looking very strong at the moment, with upright frames up to 12 metres high and beams from 1350mm to 3650mm in length. We have a wide range of compatible warehouse racking accessories for this system, including beam locks, timber decking, column guards and pallet support bars. You can see below a video clip of a recent installation of used Link 51 pallet racking that we have completed for a customer in York. We have also supplied this type of industrial racking to customers in Lincoln, Wrexham, Gloucester, Newcastle and Peterborough, so wherever you are in the UK we can help you with your warehouse storage needs. Call us now on 0800 612 3210 or send us a message using the enquiry form and we will get back to you quickly. Industrial pallet racking deliveries are leaving our warehouse every day and we prefer it if the artics are full! We have part loads currently due to leave us in the next 10 days, so if you have an order to place and you are close to Peterborough, Stockport, Leeds, Gloucester or Newcastle get in touch now and we will do our best to arrange a quick order at a low price. We have huge stocks of all the major warehouse racking manufacturers (and most of the smaller ones) and so we can always find the right storage system for your business’s requirements. Whether you need Dexion, Apex, Link 51, Redirack, Hilo to add to your existing racking, or you don’t know what make your racking is, our knowledgeable and helpful team are here to assist you. Give us a call now on 0800 612 3210, or send us an enquiry form and we will get back to you quickly.